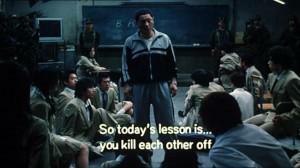 In this controversial, violent and bloody parable of adolescence, Kinji Fukasaku makes ‘Battle Royale’ one of the least spoken films in the history of cinema. In no way BR is equivalent to ‘Hunger Games’ or vice versa. Both films were made with different intentions that are better understood when watched. BR is way bloodier and melodramatic than HG and less elaborate. youth as they’re turning in to a menace. Although, the government has passed ‘Millennium Education Reform’ act, there’s very little it could do to address the rapidly growing problem and therefore decides to crack down on kids. They create Battle Royale, a game that’s conducted in a far away uninhabited island, where students of 9th grade from a randomly selected school are compelled to participate in a three day ‘last man standing’ game. At the end of the third day, the last man/woman standing is adjudged winner and freed provided all others are dead. There are three ways to teach things to others – good, bad and the hard way. Based on the premise of juvenile delinquent race in a futuristic Japan, the film chooses the hard way over good and bad to imbibe some amount of discipline in the coming generation. You might argue why the hard way instead of good or bad? Violence here is merely as an instrument to counter delinquent youngsters who are on the verge of becoming a threat to the society. Stanley Kubrick’s ‘A Clockwork Orange’ uses a similar experiment sans violence or bloodshed to imbibe certain skills into Alex, who’s put through an aversion therapy. The idea of throwing children into a battlefield is to understand the importance of life and learn to survive. Survival becomes a herculean task when you have myriad obstacles along your way. Likewise, survival on this lone island means wiping off every obstacle along the way, which by the way are fellow students. Violence won’t turn these kids into murderers because they killed each other out of fear but not power. is not suitable for audiences below the age of 15. The film has some raw, unadulterated performances’ by some aspiring kids who were definitely a treat to watch. I would like to commend the director for arousing the audience emotionally with subtle moments of brilliance. There are scenes that explicitly bring forth love, compassion and friendship in vivid fashion. One scene in particular is where a kid comes searching for a girl to actually be with her and protect but upon seeing the kid in her vicinity, she shoots him down. However, just minutes before his last breath, he tells her how much he loves her and had actually come searching for her just to look at her face. In another scene, a friend keeps up his promise to protect his dead friend’s girlfriend until his last breath. 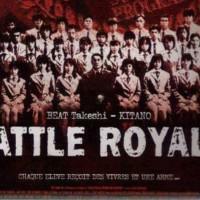 ‘Battle Royale’ is undoubtedly a gem in its own kind which may have gone unnoticed for many years now. ‘Battle Royale’ holds the number one spot in Quentin Tarantino’s list of 20 best movies since 1992, the year he made his first film.